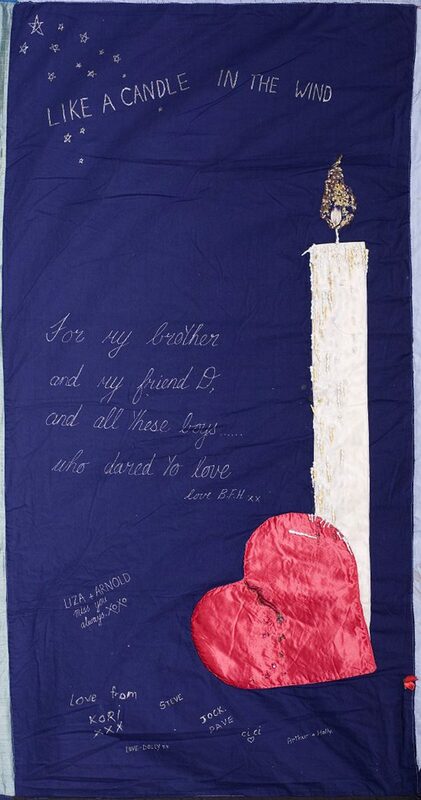 Leslee made this panel primarily for her brother but it also remembers a friend and all those who have suffered and died in the AIDS epidemic. She does not want anyone else to suffer as her brother did and she hopes that this panel will contribute to the educational function of the quilt. A dark blue background fabric contrasts with the main feature, a glowing white candle. Leslee said her brother really liked candles. “At the end – when he died – he wanted candles all around his body, and it didn’t happen. So this is his candle because I’ve never forgotten that he didn’t get any. The waxy effect of the candle has been achieved by using layers of curtain net, and the wax falling down the side – representing tears – has been created from broken Christmas decorations. Her brother loved Christmas And these decorations were part of his last Christmas celebration. Leaning against the base of the candle is a red satin heart, broken through the middle, where the candlewax tears have come to rest. Leslee says “The heart is for all the people whose hearts got broken. The people that learn that they’ve got AIDS. Their hearts must break from then until the day they die, and the families and the partners, just everyone.” Leslee said her brother didn’t always approve of her dress sense so just for a laugh – and she has shared many laughs with him – she has padded the heart with the remnants of an old cardigan he disliked. Curved across the top of the panel, in silver lettering, are the words ‘Like a Candle in the Wind’. For the last few years, his life flickered like the flames of a candle, sometimes strong, sometimes weaker. But he loved life and enjoyed travelling, roller-skating, skiing, cars and his pets. At the bottom of the panel, family members have written their names as a tribute to his memory.